Roaring Brook Press, 9781596439528, 384pp. Most Dangerous is the award-winning nonfiction account of an ordinary man who wielded the most dangerous weapon: the truth. 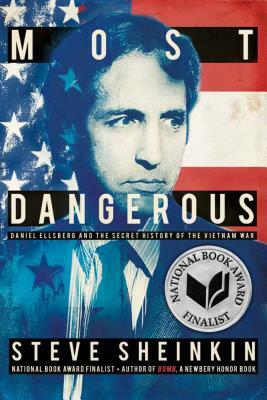 In 1964, Daniel Ellsburg was a U.S. government analyst, helping to plan a war in Vietnam. It was the height of the Cold War, and the government would do anything to stop the spread of communism—with or without the consent of the American people. As the fighting in Vietnam escalated, Ellsburg turned against the war. He had access a top-secret government report known as the Pentagon Papers, and he knew it could blow the lid off of years of government lies. But did he have the right to expose decades of presidential secrets? And what would happen to him if he did it? A lively book that interrogates the meanings of patriotism, freedom, and integrity, the 2015 National Book Award finalist Most Dangerous further establishes Steve Sheinkin—author of Newbery Honor book Bomb and as a leader in children's nonfiction. This captivating nonfiction investigation of the Pentagon Papers has captured widespread critical acclaim, including features in The Washington Post and on NPR, selection as a 2015 National Book Award finalist, and selection as winner of the 2016 YALSA Excellence in Nonfiction Award. From Steve Sheinkin, the award-winning author of The Port Chicago 50 and Newbery Honor Book Bomb comes a tense, narrative nonfiction account of what the Times deemed "the greatest story of the century": how whistleblower Daniel Ellsberg transformed from obscure government analyst into "the most dangerous man in America," and risked everything to expose years of government lies during the Nixon / Cold War era. On June 13, 1971, the front page of the New York Times announced the existence of a 7,000-page collection of documents containing a secret history of the Vietnam War. Known as The Pentagon Papers, these files had been commissioned by Secretary of Defense Robert McNamara. Chronicling every action the government had taken in the Vietnam War, they revealed a pattern of deception spanning over twenty years and four presidencies, and forever changed the relationship between American citizens and the politicians claiming to represent their interests. The investigation that resulted--as well as the attempted government coverups and vilification of the whistleblower--has timely relevance to Edward Snowden's more recent conspiracy leaks.